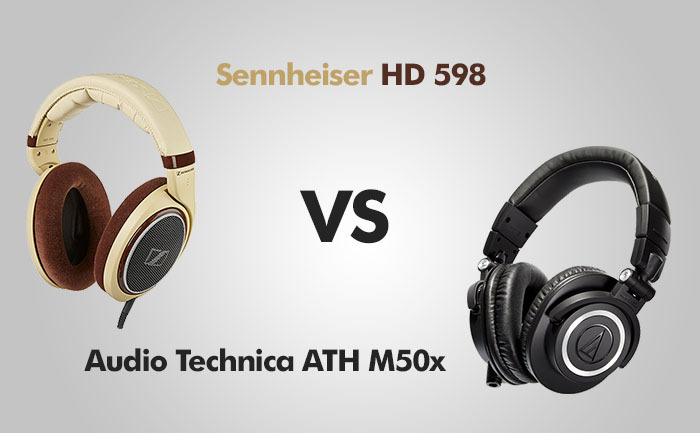 In this comparison, I will compare two pairs of headphones, one from Sennheiser a the other from Audio Technica. There are a few differences between them which I am going to present in this comparison. The build quality of both models is average. They are almost entirely made of plastic, with some metal accents in M50X. This decision may seem like a cheap move from Sennheiser and Audio Technica, but it allows to keep the weight low – 270 grams for HD 598 and 285 grams for M50X. The biggest difference between these two models is that the Sennheiser headphones are open-back (close-back version is also available), and M50X are closed-back making them suitable for a bit different environments. The headband in HD 598 is made of foam and real leather, rather than synthetic counterparts. Along with the velour earcups, they create a luxurious feel. Sennheiser describes this design as: “inspired by sport sedan interiors”. The M50X model is very similar to M50, especially when it comes to design. The are no major changes, pretty much everything in M50X is identical to its older brother. The headband in M50X is reinforced with a steel band. While big, the headband and earcups don’t stick out much from the side of your head. 3 meter coiled 3.5 mm cable. The cables in both models are removable. The 2.5 mm jack plugs into headphones with the twist-to-lock mechanism. It keeps a cable safe in place when attached. don’t have active noise cancellation like Boses. Both models have low enough impedance to be used with portable devices such as smartphones or tables. But they truly start to shine when you use an amplifier. The Sennheiser HD 598 are open-backed headphones. The speakers are covered by metal grills rather than plastic. This type of headphones lowers resonance for a more natural sound and better audio fidelity. The sound separation is excellent. There is no problem shifting my attention to different instruments or vocals. It has the best soundstage I have ever experienced. Although closed-back headphones usually deliver better bass than open-back headphones, HD 598 offers more natural lows without pumping in an artificial bass. Mids and treble are perfect and can compete with much more expensive headphones. Vocals are reproduced naturally and made listening to the same old songs with the new experience. The soundstage is naturally better in open-back headphones like HD 598 and is lacking in M50X. There is some separation between instruments, but not as good as in HD 598. These headphones offer a passive sound isolation and don’t leak much sound outside, making them a better candidate for leaving your home and going for a walk. The bass in this model is very good, and it goes down to 10 Hz which is inaudible to the human ear. The low tones are not artificially enhanced, so there is no such a tight kick like some other models can offer. Detailed and smooth treble sounds exciting and can satisfy even more demanding users. M50X are monitor headphones. This means that they aim to give you the best representation of the sound possible. This is also referred to as a transparent sound. For many audiophiles having flatter frequency response is prized because you can equalize your music this way. Monitor headphones are required in recording studios because they don’t alter the sound drastically. The ear cups in these headphones are made of velour and are big enough to fit even big ears, so most people should be able to use them for many hours without discomfort. The soft headband eliminates pressure from the top of the head, and the earcups add very little pressure to the sides of the head. These are monitor headphones and are designed to be worn for many hours. The headband in M50X successfully spreads pressure over your head and the earcups sit around your ears, rather than clasping them, making these headphones delightful to wear. The earcups have the ability to fold and flip over 180 degrees, making them more suitable for traveling than HD 598. PROS: Comfortable / Sturdy / Great soundstage / Light / Old-school design. PROS: Good looking / Multiple cords provided / Travelling case / Flat sound. CONS: Made of plastic / No case / Not portable / Have to use an adapter for most portable devices. CONS: Soundstage is lacking / Proprietary cord.